OK, it's not quite a bento today, but we've been using this dip/spread in a few bentos that I still need to post and it is amazingly yummy. It's a Carrot-Ginger Dip, but we've also been using it as a sandwich/cracker spread as well as a veggie dip. We grabbed a quick snack with it today, so I had to take a picture to use. 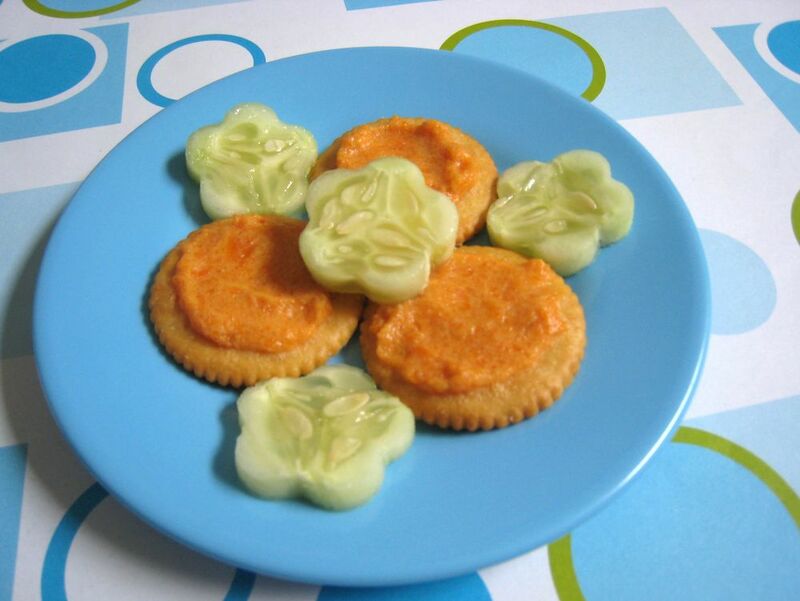 The crackers are from Aldi, I think, and of course, we have some cucumber flowers. I've had a few people ask why I always have shaped cucumbers. No special reason, but cookie cutters are much easier than having to peel the cucumber! And a recipe, because it is that good! I found it in Family Fun magazine, but modified it a little, because I was out of fresh ginger (I used dried instead). -Bring the carrots to a boil, then let simmer until tender (soft enough to be able to puree them). -In a mini food processor, blend carrots till smooth, then add seasoning and blend again. -Add yogurt, blend one more time and chill. Next time, I'm thinking of adding the yogurt in a smaller amount and slowly adding more. I would have liked it a bit thicker, but it may just have been the yogurt I used. Yum! Some of my favorite cominations! Must try!